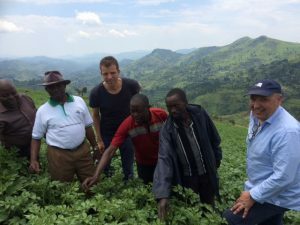 Niek Thijssen is one of Agriterra’s business advisors of DR Congo and Eastern Africa. This week he explains why growing coffee works great as conflict prevention. Niek: “I’ve been involved with Africa almost all my life. Before joining Agriterra I’ve worked in Chad, Guinee Bissau, Niger, Rwanda, Burundi and DR Congo. Wherever I was located at the time I was always involved with strengthening local agricultural capacity. Sub-Saharan Africa is still for the largest part an agricultural economy, so to enhance development you’ll have to start with agriculture. “I’m currently mostly focused on Congo in central Africa. It’s a huge country the size of Western-Europe, so it’s impossible to make generalizations about the country as a whole. Agriterra is mostly involved in Eastern Congo, near the border of Tanzania and Rwanda. This is an extremely fertile region so there is lots of agricultural potential. We’re supporting four coffee cooperatives in this region. Coffee is a great product to work with for stimulating a more fair production chain. Right now, most processing is done outside of the country; cooperatives just export the raw beans. But if we can assist them to move a part of the processing activities to Congo we can increase the income of farmers and connect more people to a stable source of income. Think for instance of coffee roasting or coffee milling. In Kenya and Ethiopia there are successful in this ‘fair chain’-approach. Cooperatives are great partners to make this happen and they also stimulate the democratic level in society by practicing it in their organizations. 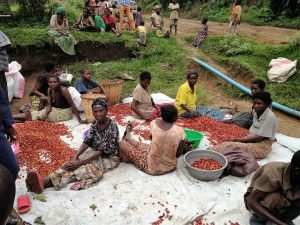 “Agriterra has been involved in Congo for as long as we exist, since 1999. In the early years, we have mostly focused on the farmer federations to kick start a proper farmer movement. The farmer community is much stronger and tightly-knit in eastern Congo than in the west of the country. We have developed a special advocacy tool for farmer organizations called FACT (Farmers advocacy consultation tool). This tool allows for a proper functioning of the cooperatives because it helps ordinary members to get their voices and grievances heard. This again allows for the writing of smart proposals to the local government with concrete and useful requests for their members. Think of lobby for better roads, calibrated weighing scales, bigger agriculture budget for research and extension services, fair taxes, etc. “Engagement and commitment from individual members is very important; this makes for more stable cooperatives where farmers don’t run away to another cooperative or a private trader if they offer a few cents extra. This is an issue that is prevalent in other areas. The governance structure might be in place but if there isn’t a democratic culture then the result can still be minimal. We try to make sure that in the end the actual power is held by the members and their leaders, and that they are assisted by professional staff for the day-to-day work.